The government looks likely to avoid another potential Commons defeat on Brexit, the BBC understands. Tory rebels have been concerned about plans to put the Brexit date and time - 11pm on 29 March 2019 - into law. But backbenchers have tabled an amendment to the EU Withdrawal Bill allowing some flexibility. Ministers are highly likely to accept the amendment in a vote next week, BBC Political Editor Laura Kuenssberg said. It comes as EU leaders agreed to move to the next phase of Brexit talks. Theresa May suffered her first Commons defeat as prime minister on Wednesday, as Tory rebels joined forces with Labour and the SNP to vote for a plan to give MPs a bigger say in any Brexit deal. Ministers feared they might be heading for a further defeat on Wednesday, when MPs vote on a plan to enshrine the Brexit date in law. A number of Conservative MPs had echoed Labour concerns the move could box Britain into a corner if negotiations with the EU go to the wire. Several Conservative MPs, including former Cabinet minister Oliver Letwin, have now tabled an amendment to the bill that would give the government more flexibility over the exit day. The new amendment seeks to allow the government to change the "exit day" through further legislation, if the negotiations are continuing. Ministers are likely to accept their plan, which is a change that some of the potential rebels have been asking for, the BBC understands. Senior sources are confident they can see off a defeat, after No 10 said there were no plans to take the date out of the bill. 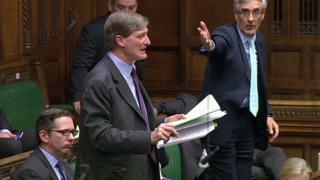 Conservative MP Dominic Grieve, who led Wednesday's rebellion, told BBC Three Counties Radio: "I am aware that the government has, I think, this afternoon tabled a further amendment for next Wednesday, which very sensibly looks like it will resolve the issue that was troubling some of us. "If that is the case, and I am fairly confident it is, then that issue will be satisfactorily resolved." Bernard Jenkin, a leading Tory Brexiteer, said: "The purpose of this amendment is to avoid needless division over matters of detail when we should be supporting the PM. "Nothing that has occurred alters the determination of the government to achieved the kind of Brexit that the PM set out in her Lancaster House speech - which takes back control of our borders, our money and our laws and our our ability to do meaningful trade deals."